Wondering how to satisfy a sweet tooth without overdoing it with a row of Oreos? If you have a blender and a few ripe bananas lying around, then this gem of a recipe will give your sweet tooth a run for its money. 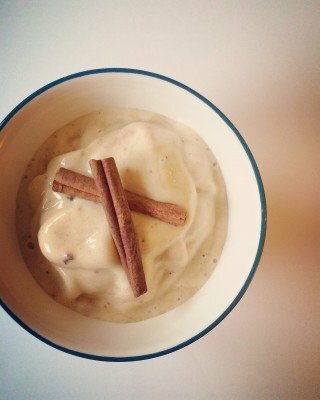 Vanilla Chai Cinnamon Nice Cream – it’s dairy-free, refined sugar-free, and gluten-free. So, what’s left? Flavor, my friends. So. Much. Flavor. In addition to some impressive nutrients: Dietary fiber, potassium, and copper. In a high-powered blender, combine ingredients and blend until creamy and smooth. Pour into serving bowls, top with a dusting of cinnamon and enjoy! Be prepared for nice cream in a pinch and have a bag of frozen banana chunks on hand. Use ripe bananas (with spots on the skin), peel, break into large chunks, put in a freezer bag and freeze. Depending on your blender power, you may not need any plant milk to reach the creamy nice cream consistency. Add plant milk to thin or omit plant milk to keep thick. Written by: Coach Jentry on October 5, 2018.